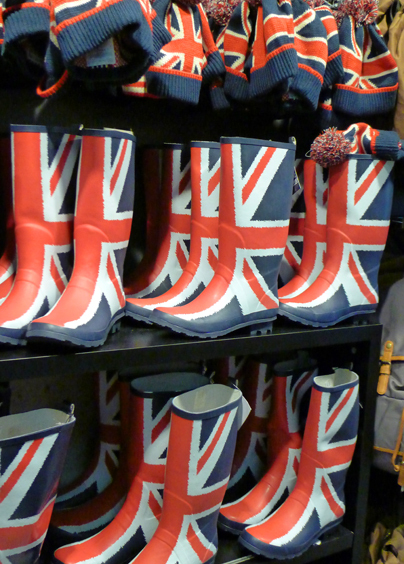 Best Places to Shop in London – I Love Primark! Terrific bargains at the Primark Store on Oxford Street! 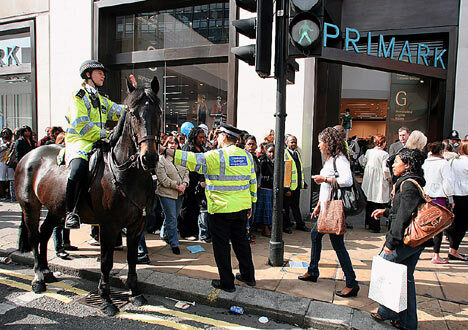 When the Primark store opened on Oxford Street in 2007, there was a near-riot as 3,000 customers pushed to get in first. There were rumors of unheard-of bargains, some of which were true. The crowds were so thick that riot police and police officers on horseback were called in to control the crowds. Now that’s some serious shopping! 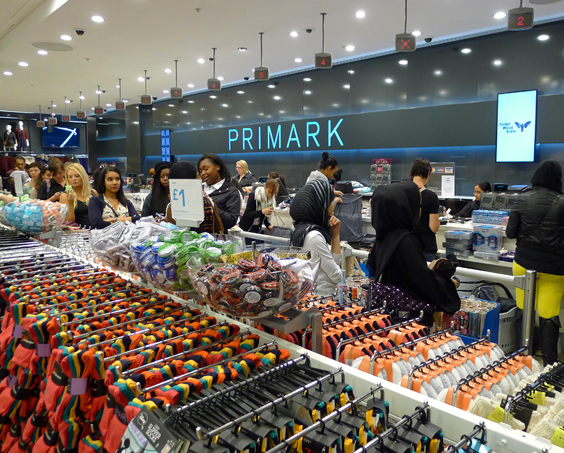 The Primark has become a London shopping fixture on Oxford Street since it opened and attracts visitors from around the world. 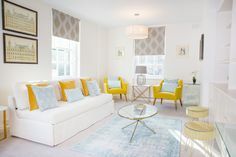 It’s located near the Marble Arch Underground station at the northeast corner of Hyde Park. You can’t miss it! Even though it has been open for awhile, it still attracts a big crowd daily. I walked past the store for 5 years, thinking it was mostly for teens. But finally I walked in last spring and had a blast. 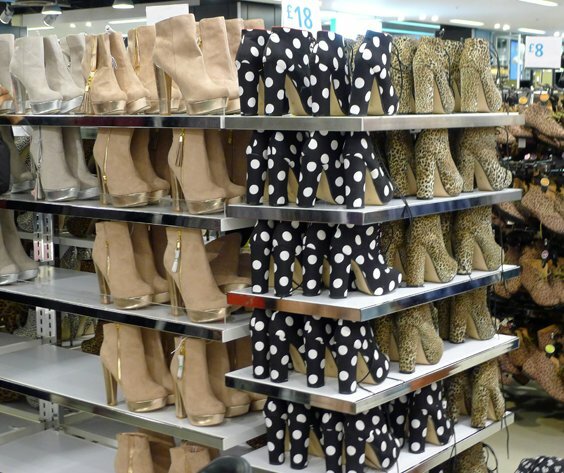 I’m now a convert – I love Primark! First tip: get there early. The store is crowded with customers from the minute it opens to the closing bell. People come from all over London and even France to shop here. I spotted a couple of French girls having fun trying on hats. 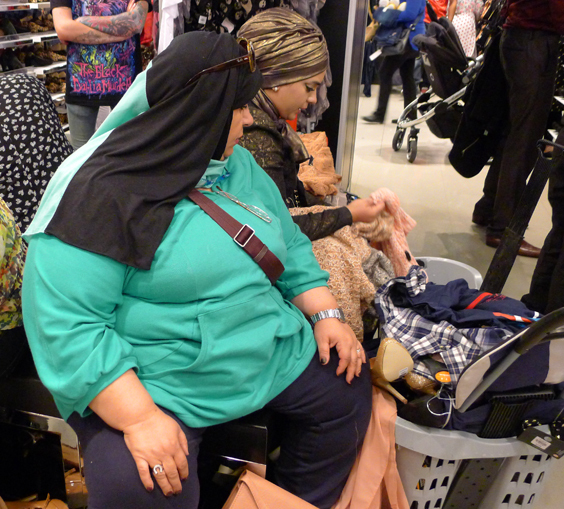 French Girls Trying on Hats and Headbands – they love shopping at Primark, too! If you’re looking for designer label goods and high quality, this isn’t the store for you. 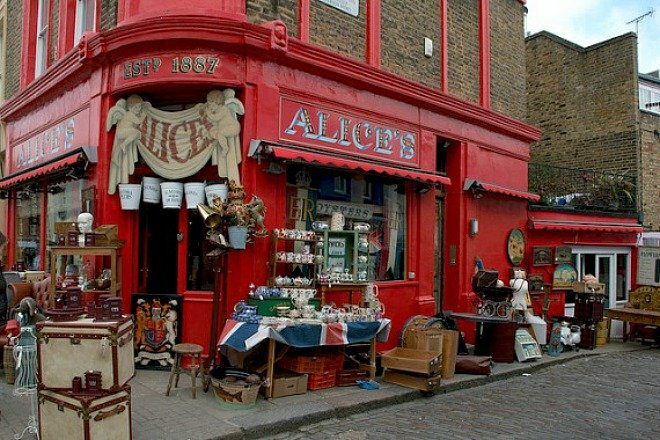 But for that little accessory, shirt, sweater, shoes or pair of slacks – you’ll find some excellent prices. 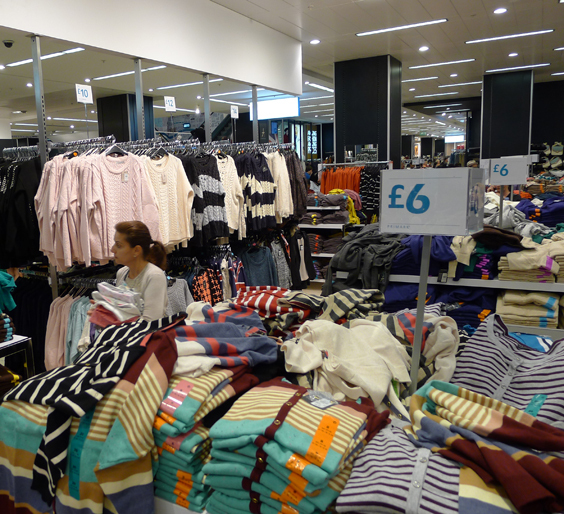 Primark has loads of women’s, men’s and children’s fashions at incredibly low prices. The theory is similar to H&M’s, tons of merchandise and high turnover, so if you see something you like – don’t wait! 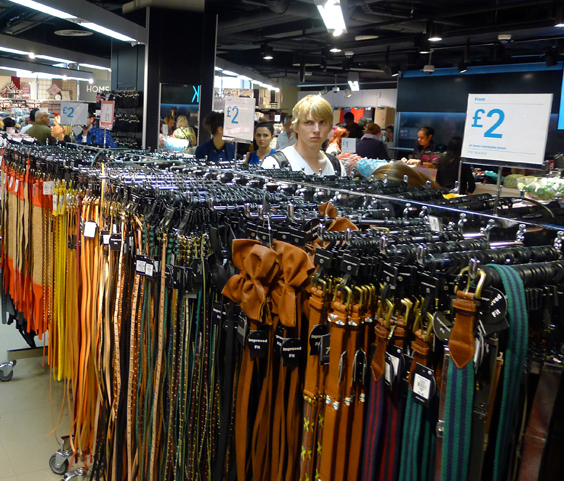 I was impressed by the belts and women’s accessories – a huge selection for only a couple of pounds! Everyone comes here to Primark. It was fun to observe the many ethnic groups who shop here . This was a fun scenario – on one side of the bench were Saudi women with head scarves and on the other side sat a girl with pink hair and tattoos trying on boots! And trying on black boots behind them, a cool, punky looking East Ender! 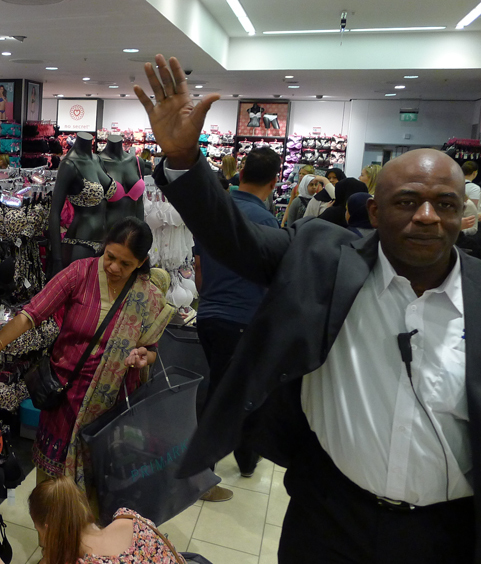 I was having alot of fun taking pictures of the shoppers – until security stopped me! I asked for tips on which cash registers had the shortest lines, but he said it depends on the time of day. 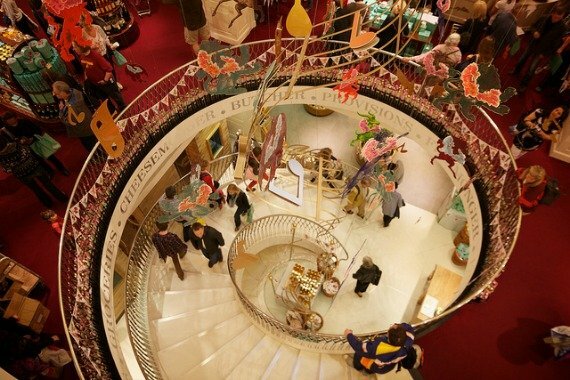 My advice is upstairs in the men’s department – there are 2 register areas near each other. People flock to one, leaving shorter lines at the other. ‘Stop Taking Pictures Please!’ – Busted! I couldn’t resist taking more pictures, and it became a game for me to take as many pictures as possible! 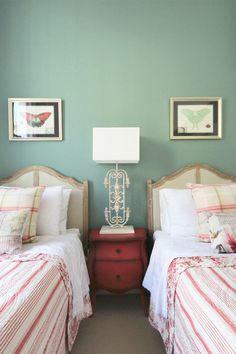 There are 5 or 6 large cash register areas – scope them out first to find the shortest one. But expect lines pretty much any time of day. Some women come prepared with friends to help them manage the shopping baskets. One shopper had three roller baskets filled to overflowing before starting to shop on the upper floor! After my adventure at Primark, I came home with a $20 (GBP 12) Argyle sweater with a gold thread running through it. I wear it all the time! My friend Chris helped me put it together to make a great outfit. The sweater looks great with my gray skirt, white shirt, casual necklace and flats. 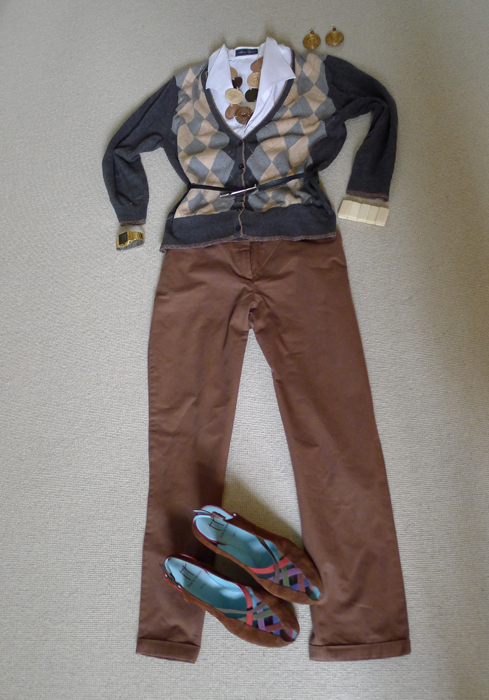 Or with a pair of brown pants and fun shoes. 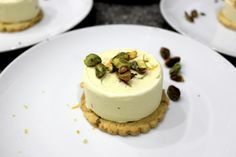 With long pants – perfect for cooler autumn weather! 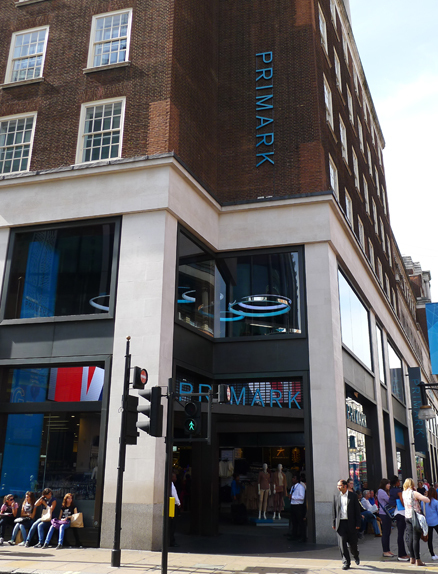 You’ll find the Primark store at 499 Oxford Street at the corner of Portman Street. It’s open Monday to Friday from 8:30am – 10:00pm, Saturday from 8:30am – 9:00pm and Sunday from noon-6pm. Happy bargain hunting at Primark! 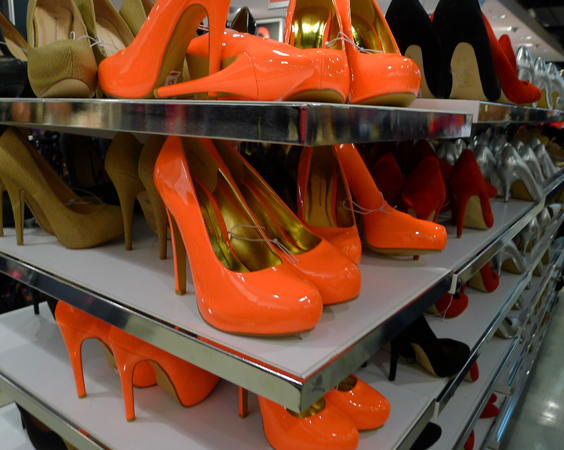 Posted on Saturday, October 6th, 2012 at 5:51 pm in Shopping. You can follow any responses to this entry through the RSS 2.0 feed. You can leave a response, or trackback from your own site.